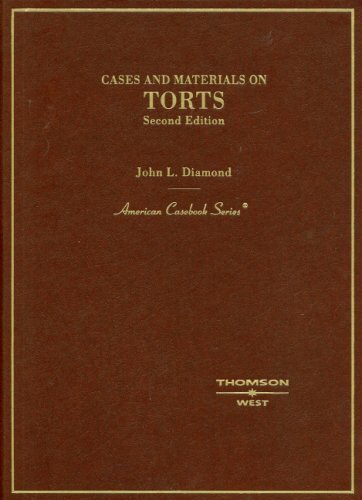 The new edition focuses on the current controversies in Tort law. Changes in the law endorsed by the Restatement (3rd) are explored. The casebook strives to invigorate the study of intentional torts by going beyond the traditional personal injury approach. Battery is considered in its increasing application in environmental litigation. The torts of intentional interference with contractual and economic relations, which almost all students will encounter in whatever field of practice(e.g. corporate, entertainment, public interest) they ultimately choose are introduced in the basic intentional tort section including the case that nearly bankrupt Texaco and the potential liability of an environmental public interest group for encouraging a boycott. The negligence section addresses controversies ranging from parental liability for failure to prevent a child from committing homicides, mental distress for exposure to toxic pollutants to tobacco industry liability. The necessity defense is considered in the context of Katrina. Negligence is critiqued from feminist, economic and other perspectives. Cases have been selected for their teachability and stimulation for students. Notes are straight forward to allow professors freedom to focus on policy concerns. Address: NORTH MIAMI BEACH, FL, U.S.A.